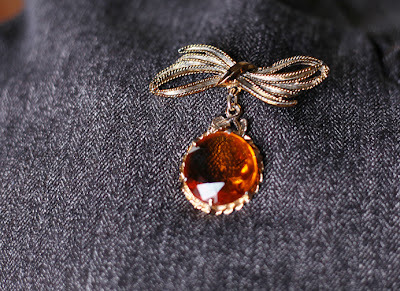 This little amber-coloured bow brooch was an absolute must-have for me the moment I saw it on eBay, it went onto my watch list and I checked it's progress far more frequently than necessary to see whether it had been bid out of my strict price budget and luckily, as a last minute sniper, I got it for the bargain sum of around £4 including postage. I'm a huge fan of vintage brooches as not only do they tend to be infinitely prettier than anything I've found in high street shops they are also incredibly versatile; you can pretty up noticeboards, turn them into magnets, of course accessorise an outfit but also add sparkle to a cushion. 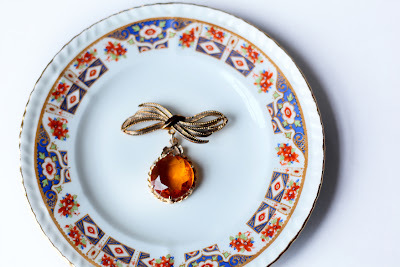 The dangling gem on this particular brooch lends itself to being popped onto the lapel of a military style blazer I have, or perhaps being converted to a pendant, either way I see it getting plenty of use as time goes on! I believe it stated in the listing that the brooch is 1940s and certainly fits with the land girl aesthetic of the period, as in the first pic I can well imagine it being pinned to a tweedy sort of fabric but whether 60 years old or 6 I love the sense of understated glamour about it. Love amber - love the shades it can take depending on the light. I've become your newest follower. Great blog. I've just bought a couple of vintage sparkly brooches which are destined to become part of a feather fascinator for my hair. PS. Am now following you. You obviously have the same compulsion to acquire old stuff and then write about it as I do!